Europe's Photovoltaic markets are expected to grow despite economic uncertainties, particularly in the sunny southern climates. But Jason Wright, senior director of risk advisory firm Kroll, says investors must also be keenly aware of the administrative and regulatory issues concerned, as well as the potential for fraud and mafia involvement. Trina Solar Ltd has signed a strategic partnership agreement with TUV Rheinland Group, Underwriters Laboratories Inc (UL) and China General Certification Centre (CGC). Extended suite of services offered to help stakeholders manage risks and reduce costs associated with building and operating PV plants. UL's PV plant services developed to provide assistance to investors, developers and operators to make better and informed decisions as they assess the risks and uncertainties associated with designing and commissioning a PV plant. From the design stage to the commercial operation date (COD) and throughout the in-service lifetime of a PV plant, factors such as performance, energy yields and verification are critical. Although UL has typically been thought to be involved further upstream in the PV value chain, Butler says UL has been involved end to end through its installer trainer, field evaluation services, certification services and working with AHJs. 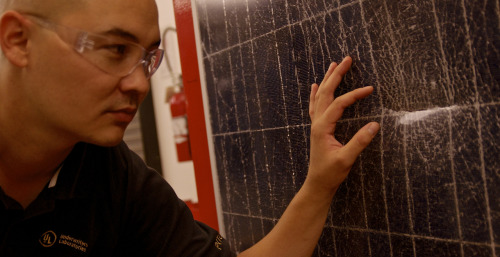 "We offer a total solution for PV power plants,” Butler stated. For more on this article, look for the forthcoming May issue of Renewable Energy Focus magazine. In this extended feature, UL's Butler provides specific details on how the company's PV plant services take different regional factors into consideration. She also cites case studies illustrating examples of how the guidance UL provided has helped PV plant developers and operators mitigate risk. Subscribe online today!